A suggestion that white and non-black protesters limit their visibility and "stand behind black folks" at protests Tuesday in Ottawa and Toronto against the fatal shooting of a black teen in Ferguson, Mo., has sparked a heated debate on social media. Bilan Arte, one of the Ottawa event organizers, says on the vigil's Facebook page that "white/non black allies" should "refrain from taking up space" and "never be the centre of anything." The same message appeared verbatim on the Facebook page for the Toronto rally, asking whites and non-blacks not to speak to the media, saying "black voices are crucial to this." Arte's post prompted more than 100 comments, with one man asking, "Is this an anti-racist rally or a pro-segregation one?" Arte, deputy chairwoman with the Canadian Federation of Students, says on her own Facebook page that she's received upward of 50 messages from "righteous upset white people" taking issue with the post. Paige Jackson and RebeccaMacintyre, who are both white, were among the hundreds of protesters who gathered outside the U.S. Consulate in Toronto on Tuesday night. They told CBC News they had no problem letting black demonstrators take centre stage. 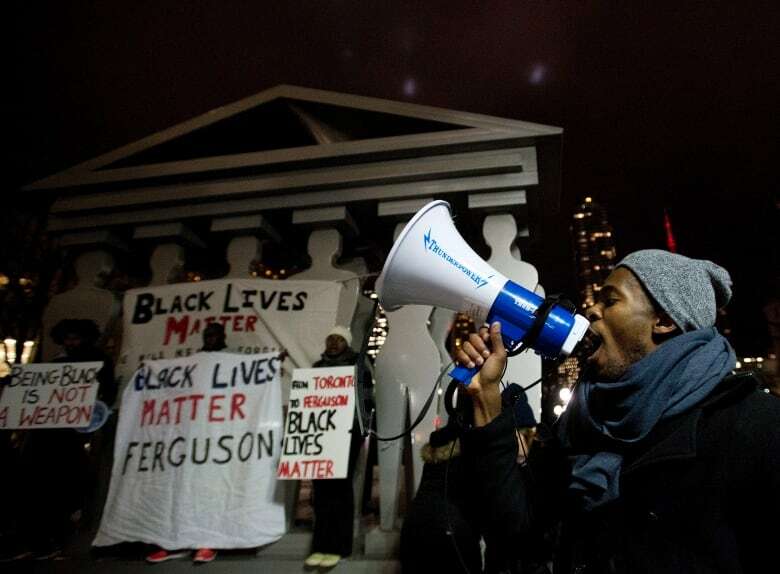 People protest a United States grand jury's decision not to indict a police officer who shot and killed Michael Brown of Feguson, Mo., outside the U.S. Consulate in Toronto on Tuesday, November 25, 2014. (Nathan Denette/Canadian Press)"For us, it's really important to come up and show our solidarity and make sure black voices are leading this — that their feelings and opinions are front and centre for everything happening here. We're just here to show support and be allies." "The best allies we can be," added Macintyre. "It's not about us. It's about showing solidarity with people whose lives are affected by Ferguson — and that's not really us. That's not really white people." The protests in Toronto and Ottawa follow a decision Monday by a grand jury in the U.S. not to indict a white police officer in the shooting death of an unarmed black man, 18-year-old Michael Brown. A riot followed and thousands of members of the National Guard have been called in to help prevent a second night of violence. The peaceful protests in Toronto saw hundreds of demonstrators gather outside the U.S. Consulate, shouting "being black is not a crime" and other slogans against police brutality, while others held a candlelight vigil. "Basically, I don't want to live in a world where some lives matter and some lives don't," said Christina Miniaci. In Ottawa, dozens of people — some holding signs saying "black lives matter" and "racism exists" — rallied outside the American Embassy.